A DHC-6 Twin Otter operated by Air Moorea as flight 1121, departed Moorea-Temae Airport in French Polynesia. After a normal takeoff, the flaps were retracted at around 350 feet. The pilot then lost pitch control of the aeroplane, which adopted a steep nose-down attitude. The pilot was unable to regain control of the aircraft and the Twin Otter struck the sea, broke up and sank. The accident was caused by the loss of airplane pitch control following the failure, at low height, of the elevator pitch-up control cable at the time the flaps were retracted. - Failure of the last strands as a result of strain during the flight when using the elevator. - The rules for replacement of stainless steel cables on a calendar basis, without taking into account the activity of the airplane in relation to its type of operation. Require operators to perform an inspection as soon as possible on stainless steel stabilizer control cables installed on DHC-6 Twin Otter airplanes, with particular attention being paid to chafing areas in contact with cable guides. Consider extending these inspections to carbon steel cables that may also be installed on the stabilizer control system of this airplane. That a review be undertaken, in the light of the lessons learned in this investigation, of the design and in-service experience of other aircraft on which stainless steel cables are used for the primary controls so as to determine the measures that may prove useful to safety. DGAC encourage operators to transmit to manufacturers all information on technical anomalies detected that are not included in the maintenance documentation. EASA consider the appropriateness of taking jet blast into account in the process of aircraft certification. The monument remembering the victims of the crash of Air Moorea flight 1121. 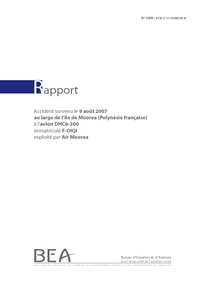 Distance from Moorea-Temae Airport to Papeete-Faaa Airport as the crow flies is 18 km (11 miles).